1. A penguin with two snowmen for January. Where I live in New Mexico we don't get much snow, if any. If it does snow, it is gone by noon. I miss snow! 2. An umbrella with rain boots for April. I like it but our rain season starts mid-June and ends in September. However, someday we will move and I may see rain in the spring. 3. A Happy Birthday one. This one I intend to do, I just don't know when. I feel I have to wait another year because some of the kids had their birthday this year. I guess it can wait and I can focus on other projects. 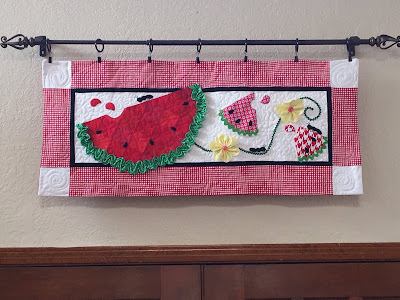 Let me just say for this watermelon wall hanging, I adore the fabric ric rac I made for the larger watermelon. This has nothing to do with my skills, it was all in the directions, but to loosely stitch and then pull and have that happen. So cool!